A gift of no consideration: This means that the previous owner signs over their share of their property with no expected benefits i.e. no money changes hands. The removal of a name following death. 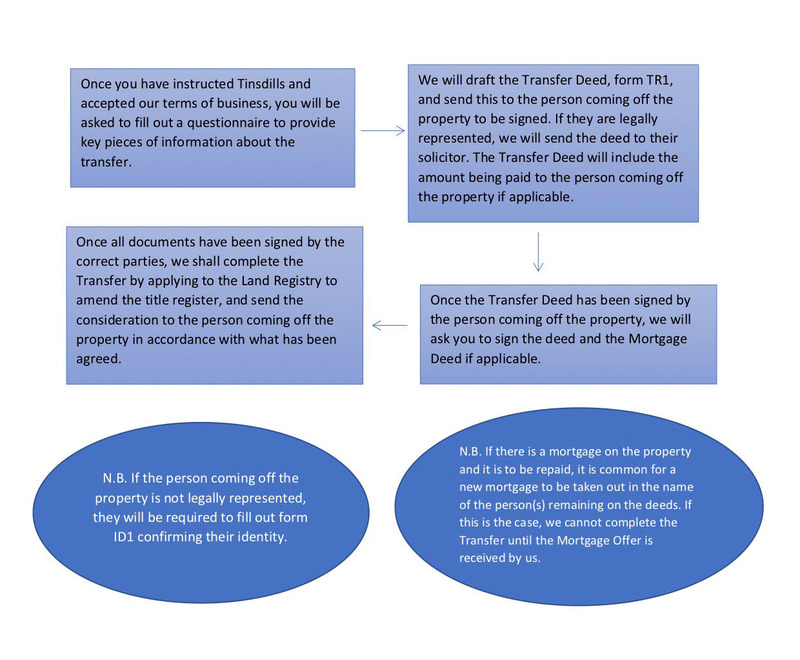 A transfer 2-1 with or without a mortgage: Where there is a mortgage or financial consideration involved, lender approval must be sought or a new mortgage put in place in the name of whichever party is retaining the property. The transfer doesn’t mean that the person being removed from the deeds to the house can’t claim on a divorce. If the transfer is to avoid a property being given to creditors in the case of bankruptcy, this can be set aside by trustees in the bankruptcy. You may need the Freeholder to consent to the transfer. If the property has been owned less than 6 months and there will be a new mortgage on the property, your lender will need to approve this. Stamp Duty may be payable under some circumstances. Whether the transfer is consistent with wills/tax advice/financial advice. Your rights to continuing occupation, and associated costs. You will need to make an application at the Land Registry to remove the name. The application will need to be supported by a copy of the death certificate. You may need to appoint trustees and take out a grant of probate. At Tinsdills Solicitors, we specialise in simplifying the process so that you can complete the transfer in full confidence, knowing that every box is ticked and you’re fully aware of what’s happening in every aspect of the journey. If you require help regarding removing a name from a title deed, feel free to get in touch with us. You can give us a call on 01782 652300. Alternatively, you can drop us an email at lawyers@tinsdills.co.uk.